Spring is here and it is time for cleaning! When it comes to cleaning, the best practices for boaters are also easily transferable to our lives at home, at work, and in the community. Now is the time of year I send reminders to our marina and boating community about these best practices for keeping our waterways clean. Below are a few of my favorites that I take with me wherever I go. Use non-toxic, phosphate-free, and biodegradable cleaning products. You’d be surprised how well baking soda and vinegar work on tough stains! Find our list of alternatives to toxic cleaning products here. Become knowledgeable about disposal procedures for waste and hazardous materials at work and in your community. Clean up all trash, dust, and debris immediately following any maintenance or repair activity. Dispose in your regular trash at home or in designated receptacles at your local solid waste management facility. Use a drop cloth to catch dust and debris when working over unpaved surfaces. Sweep up debris on paved surfaces when finished. Make sure trash cans have lids and are emptied regularly. Recycle cans, glass, newspaper, and other products, and ultimately try to reduce trash by switching to reusable items. Do you know where your nearest storm drain is located? Make sure that it is cleaned regularly and only rain goes down the storm drain. You can learn more about these and other tips for protecting our waterways through our Clean Boater Tip Sheets, available through the Great Lakes Clean Marina Network, online at the Ohio Clean Marinas Program website and on Facebook. Contact: Sarah Orlando, Ohio Clean Marinas Program, (419) 609-4120, orlando.42@osu.edu. What do you get when you combine the Ohio winter doldrums with a growing interest in boating and watersports? A ready-made audience at the Mid-America Boat Show. 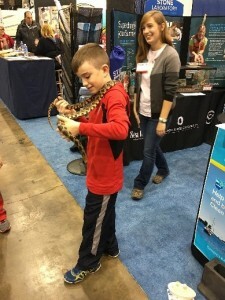 Amidst freezing cold winds and heavy snowfall, Ohio Sea Grant Educators and thousands of others made their way to the IX Center in Cleveland for the Mid-America Boat Show a few weeks ago. It is an annual tradition, having taken place for over 25 years, bringing together water lovers, boaters, adventure seekers, and all facets of the boating industry to learn, buy, sell, trade, and catch up. 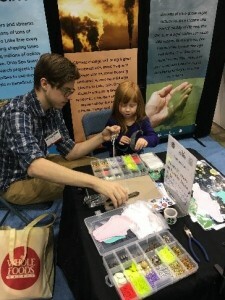 As one of the many educational exhibitors at this event, Ohio Sea Grant was thrilled to be able to teach about the importance of a healthy Lake Erie to the many visitors that attended. Stationed next to a singing pirate and personal watercraft simulator, we had some stiff competition. However, neither could stand up to the fright, ick, “Oh geez! That’s a live snake!” factor of our Stone Laboratory snakes and the al“lure” of tying your own hook for catching walleye. 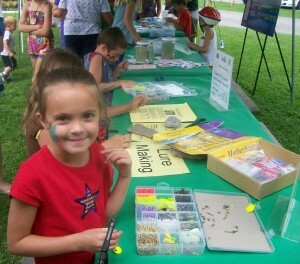 These were two of the many activities available to kids and adults at our Lake Erie information hotspot. 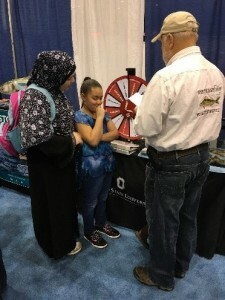 Show wanderers could spin a prize wheel to be asked questions about general Lake Erie topics, decorate a fish to add to the #loveyourlake twitter campaign, sign up to be a clean boater, and peruse a selection of outreach materials and goodies rivaling the collections of the Library of Congress. Clean, drain, and dry your boat when you move it to different waterways. Pick up trash as you see it and responsibly dispose of or recycle your own items. Take aquarium pets and plants back to the pet store or offer them to a school if you no longer want them. Reduce or eliminate the fertilizer you place on your lawn. Plant a rain garden at the end of your driveway or near your gutter spouts to reduce the amount of water running off of your property. al“lure”: Chis Pluntz, Pro Anglers. 2009. Tying hooks – Building Walleye or Trout Spinner Baits and Crawler Harnesses. Video: https://www.youtube.com/watch?v=g19jh0cB4oA. #loveyourlake: Twitter. 2016. #loveyourlake. Website: https://twitter.com/hashtag/loveyourlake. HABs: Ohio Sea Grant. 2014. Harmful Algal Blooms. Website: https://ohioseagrant.osu.edu/research/issues/habs. Wherever you live in Ohio, you probably are a boater or you know a friend or family member who enjoys boating. Ohio has over 450,000 registered boaters, ranking in the top 10 of all states in the U.S., and for good reason. Whether you have a coworker who kayaks in a Scenic River, an uncle who fishes an inland reservoir or a friend who goes sailing on Lake Erie, there are many ways to explore Ohio’s waterways. There are also many marinas who rely on these waterways and contribute to our local economies by attracting visitors who frequent our hotels, restaurants, and local businesses. Ohio Sea Grant, the Ohio Department of Natural Resources (ODNR) and the Lake Erie Marine Trades Association partnered to implement the Ohio Clean Marinas Program, a voluntary, incentive-based program designed to encourage marinas and boaters to use simple, innovative solutions to keep Ohio’s coastal and inland waterway resources clean. Since 2005, 48 marinas in the Lake Erie watershed have been certified for adopting environmental best management practices, or BMPs. 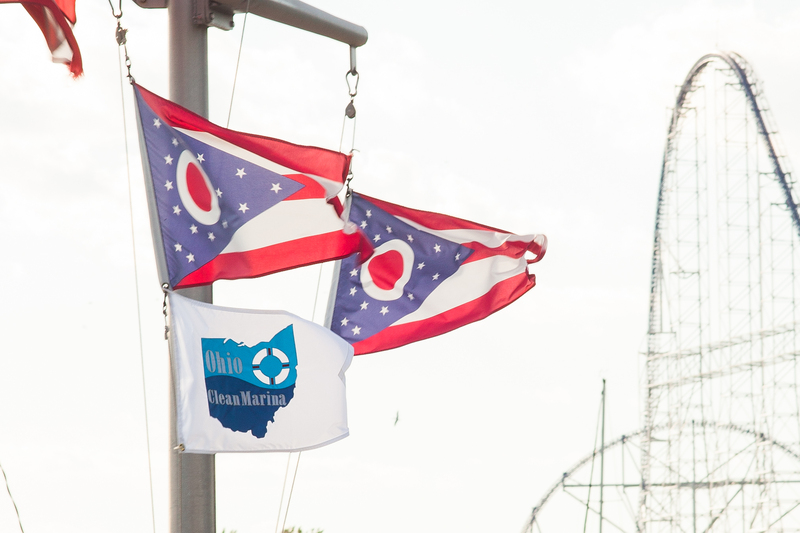 We are excited to announce that with strengthened ODNR partnership through the Division of Watercraft, we are now able to certify any marina in the Buckeye State. By engaging marinas in protecting the very resource they rely on for a successful business, we hope to help ensure our waterways are enjoyable for boaters of all kinds for years to come. 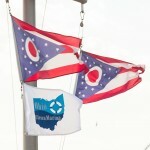 So keep a lookout for those marinas “flying the flag” of the Ohio Clean Marinas Program, and encourage a marina near you to join. 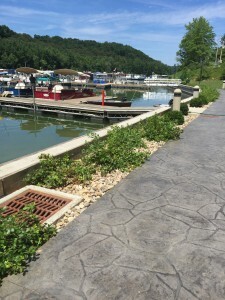 Choose a Clean Marina, and help support efforts in Ohio and beyond to protect and enhance our waterways. Lake Erie Watershed marinas and boaters wanting to be part of this initiative should contact Sarah Orlando at orlando.42@osu.edu or Jenny Roar at jenny.roar@dnr.state.oh.us. Marinas and boaters in the Ohio River Watershed should contact Heather Sheets at heather.sheets@dnr.state.oh.us. What covers nearly 10,000 square miles, many of them comprising parts of eight Ohio counties in northern Ohio? In addition to creating a natural land/water boundary of over 310 miles in length, Lake Erie is a key focus area for Ohio Sea Grant and the Lake Erie Nature & Science Center (located in Bay Village, Cuyahoga County). Ohio Sea Grant’s focus on research, education and outreach for the Lake Erie region is a great fit for the Lake Erie Nature & Science Center, which offers high-quality nature, environmental and science experiences through school field trips, preschool, family, scouting and planetarium programs, nature hikes, and a variety of exhibits connected to its expansive wildlife rehabilitation program. The Center’s staff and Ohio Sea Grant are working on hands-on informal science information sessions for 2015 that will feature experts on a variety of Lake Erie topics. Most recently, they hosted a workshop for faculty from Cleveland and Columbus that provided information, curriculum and supplies for teaching about aquatic invasive species in the classroom. On May 17, Family Fishing Day, children ages 6 and up and their families can enjoy a morning learning the basics of how to cast, where to fish and what kind of fish they’ll catch in Lake Erie. 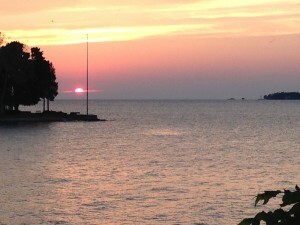 May 23 is Lake Erie Day, part of the Year of Clean Water Celebration, where visitors can celebrate all things Lake Erie. Ohio Sea Grant staff will be on hand to offer their expertise and interactive activities on aquatic invasive species, harmful algal blooms, boating and water recreation, beach safety, Lake Erie water snakes and more. For more information, please contact Ohio Sea Grant Extension Educator, Sarah Orlando. In today’s world, where any question or problem can be answered by a 0.5 second Google search, it can be easy to get caught up in an information overload and difficult to separate fact from fiction. Truly now, more than ever, I argue that sources of knowledge are needed. Providing unbiased, factual information that is relevant to our stakeholders is the core mission of Ohio State University Extension and Ohio Sea Grant. This is the value and impact that an Extension program can provide. There are often times when our opinions or foundational knowledge on a topic may be challenged – in conversations with friends, colleagues or family. During these times, I encourage you to utilize your local Extension Educator – we are here to help tackle some of the most difficult topics with factual information, to enable you to make an informed decision. In Ohio Sea Grant, we focus our knowledge on understanding our Great Lakes water resources and the challenges that come with managing these resources. We have an uphill battle against misconceptions on everything from climate change to zebra mussels, but we fight this battle with the most valuable weapon – knowledge. Our knowledge comes from working with researchers to fully understand an issue and the science behind that issue, and our expertise is in communicating that science-based information in an easy-to-understand format through education and outreach. Sign up for Ohio Sea Grant’s e-Newsletter to receive monthly updates. Subscribe to the iTunes U course, Climate Impacts in the Great Lakes, for free modules on relevant climate research in the Great Lakes. Contact one of our Ohio Sea Grant staff with your questions. Participate in the Lake Erie Discussion Board, an online forum for questions about Lake Erie and the Great Lakes. 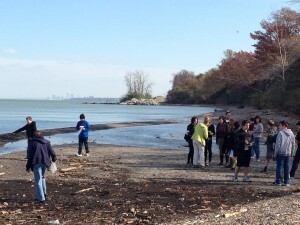 Read some of our fact sheets on Lake Erie critical issues. Take a course at Stone Laboratory, we offer options for students of all ages. Habitattitude at Greater Cleveland Aquarium – February 13-16, 2015, Cleveland, OH. World Water Day at Cleveland Museum of Natural History – March 21, 2015, Cleveland, OH. 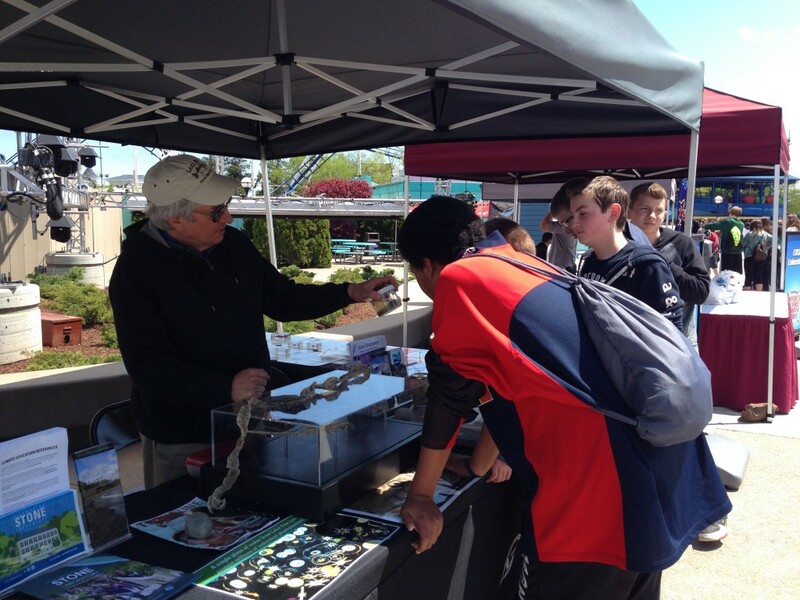 Lake Erie Day at Lake Erie Nature and Science Center – May 23, 2015, Bay Village, OH. In 2015, I challenge you to think about where your information comes from, and, if you question its validity – to reach out to those sources of credible information, such as Ohio Sea Grant and OSU Extension, to build your knowledge around a topic. As they say, knowledge is power!